4:30 am - this morning - still dark - couldn't sleep... not because of the snoring going on beside me ;) - but because of the amount of things still "to do". 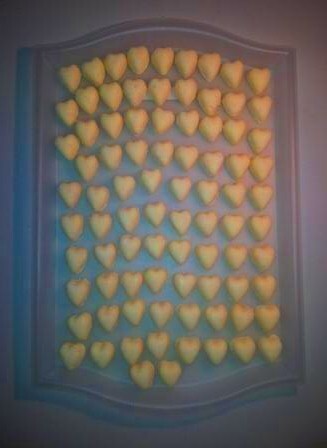 Into the studio to remove 200 Bath Bonbons from their molds. As I was going about the task, I began thinking ... "How did my 1st Holiday Shopping Event come about??" (Those who remember Soma Essentials' days, may recall attending that first event, held at Gusto's Wine Cellar - 2004). Well, two amazing women, so filled with talent and generosity, helped to inspire me to take the leap, showcase my passion, and host the initial Holiday Shopping Event. And then, my wonderful group of friends & family helped me pull it off! Janice McLaughlin and Lori Derbyshire ... I learnt so much from Janice and Lori , who, sadly, are both no longer with us. Each was a loving mother and wife, valued member of our community and successful business woman. I was impressed by their ability to balance these facets of their lives, so well. Through their business "Not4boys", they designed and created beautiful, hand-crafted, artisan jewelry, which women loved so much, they often purchased pieces for themselves - never mind waiting for that significant other to remember an anniversary or birthday. I am sure these women, myself included, treasure the pieces that were purchased at Janice & Lori's Shopping Events. When hosting an event - Create lists and use them. On Mothering - Just be present. When things get tough - Believe in yourself. In preparing for this Holiday Shopping Event, the 1st for Purple Essentials, I find myself thinking of Janice & Lori, and of their families and friends who miss them dearly, especially at this time of year. I am so very thankful to have known them both! (The world is a different place without them).